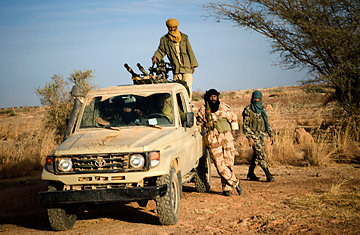 Tuareg rebels stand near a truck in Mali on March 19, 2012. After the libyan unrest the civil war in Mali between Tuareg rebels and government forces has escalated. The UN say that about 130.000 displaced person are facing a human catastrophy due to the food shortage in Sahel. Somewhere close to the Algerian border a delegation of Tuareg notables hurried through the desert for a summit. It was mid-March and there was dissension among them. One of their own, a renegade desert warrior called Iyad ag Ghali, had just thrown the Tuaregs' meticulously plotted rebellion against the Malian government into jeopardy. In proclamations appearing on YouTube, ag Ghali's spokesman had done everything that the committee behind the two-month-old uprising by Tuareg rebels wanted to avoid. "It is our obligation to fight for the application of Shar'ia in Mali," the spokesman said. The poisonous phrase, seized eagerly by a Malian government smarting from military defeat, undid months of careful political messaging. Now everyone would think the Tuareg were in bed with al-Qaeda. How the meeting between the Tuareg notables and the soft-spoken but inscrutable ag Ghali played out is known only to a handful of people. But within hours the rebel Mouvement National pour la Liberacion de l'Azawad (MNLA) broke publicly with ag Ghali, branding him a "criminal" whose efforts "to establish a theocratic regime" were anathema "to the foundations of our culture and civilization." As the mud flew, ag Ghali struck back, retorting that his Ansar Eddine group (the name means "defenders of the faith") was the new power in northern Mali. The war of words continued on March 30 as both groups claimed to have taken the strategically important town Kidal, a regional capital of 40,000 people, after days of fighting. "The rebels have been in the town since 11 o'clock. They almost have complete control," one inhabitant told TIME by phone. "They are all armed in pickup vehicles," another resident said. "Women uttered cries of joy to greet them at the airport." With disarray in Bamako, following last week's military coup, the Tuareg  secular or not  have taken their biggest prize to date and are already attacking the even larger town of Gao, 200 miles to the south. The vitriolic falling out between ag Ghali and the MNLA goes some way to illustrating the complicated tapestry of interests and tensions within the Tuareg rebellion, a topic that swam into focus first after weaponry from Colonel Muammar Gaddafi's looted arsenals flooded into the Sahara last year. With thousands of expatriate Tuaregs who worked for Gaddafi's military forced to flee Libya amid the revolutionary chaos, much of the hardware is thought to have made its way to northern Mali. Desolate and unpoliceable, this swathe of desert and rocky scrub is also home to the regional terror franchise, al-Qaeda in the Islamic Maghreb. That combination set alarm bells ringing. What, exactly, was the relationship between Tuareg fighters, with access to large quantities of heavy weaponry, and AQIM? The truth, of course, is complicated. With an eye to U.S. military assistance, economic aid, international sympathy, the Malian government has much to gain by tarring the MNLA with the al-Qaeda brush  but the links are tenuous. True, over the years al-Qaeda emirs "are said to have worked to create some local relationships, both through marriage and transactions with some segments of local Tuareg and Arab communities," explains Andrew Lebovich, an analyst with the Navanti Group who focuses on Sahelian issues. But "AQIM itself has yet to claim a role in the [Tuareg rebellion], and no overt evidence has been produced to show an AQIM role in the fighting in the north." Nor is Tuareg society the best fodder for Islamic fundamentalists. "Tuaregs prefer to worry about enjoying this life rather than... ensuring the perfect afterlife," a U.S. diplomat wrote in 2009. Tuareg women go unveiled; the menfolk cover their faces but drink and dance. In fact, it is the government in Bamako  rather than the veiled warriors of the north  that may have abetted the terrorists. In 2010, an Algerian diplomat told his US counterpart that someone in the Malian establishment had tipped off AQIM operatives ahead of a combined Algerian-Malian mission against the organization, enabling the terrorists to slip the net. "It looks worse than weakness on the part of the Malians," the Algerian diplomat growled. "It looks like willful complicity." Yet none of this helps explain ag Ghali and his defenders of the faith. "Iyad is a special case," says Andy Morgan, author of a forthcoming book on the Tuareg and a former band manager of Tuareg rockers Tinariwen. "He has undoubted strengths as a political and military leader, with a perhaps a greater grasp of political tactics and subterfuge than any other Tuareg. [And] he was as much of a hedonist as many of the other [Tuareg] living in Algeria and Libya... apparently, a great fan of cigarettes, booze and partying." Later, the story goes, ag Ghali underwent a religious re-birth, growing a voluminous beard and getting kicked out of Jeddah, in Saudi Arabia, during a diplomatic posting, for consorting with jihadists. But the key to understanding him, analysts tracking events in northern Mali say, is to view ag Ghali not as a fanatic but a man consumed by the desire for power. At a meeting last fall to deal with a looming succession crisis within the Ifoghas tribe  the Tuareg group most closely aligned with the rebellion  ag Ghali is thought to have presented himself as a potential leader, only for the tribe to turn their collective back on him. As the Tuareg revolt gathered steam in December and January, ag Ghali once again tried to insinuate himself into a leadership role, only to receive a second cold shoulder. Searching for power, but excluded from the tribal or the rebel commands, he set himself up as a religious figure, enticing anyone he could to his newly minted Ansar Eddine. The effects have been dramatic. Few observers of Tuareg politics could ever have "imagined that the relationship could get so bad," says Morgan. The rancor is growing, and only the scantiness of their resources  the MNLA has somewhere between 600 to 1,000 fighters battling across an area the size of France  and the prospect of seizing Kidal while Bamako is wracked by political uncertainty, seems to have stopped Ansar Eddine and the MNLA coming to blows. With victory at Kidal and the fall of Gao now a distinct possibility, the question is how the mainstream Tuareg rebels now choose rid themselves of their turbulent Jihadi priest.